Christy Chapman presented a paper at the 2016 World Indigenous Law Conference. She's pictured here with Deborah Sanchez, one of the keynote speakers. Born and raised in the Pueblo of Zuni, Christy Chapman was a public health nurse for several years. She hoped her law degree would open many doors to empower others. Chapman will graduate in December 2016 and already she is empowering others by being a voice for her community. 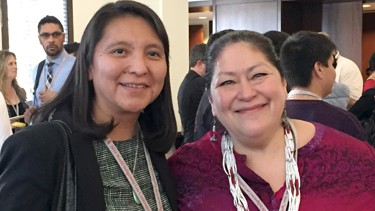 This October, she advocated for indigenous health at a prestigious international conference. Earlier this year, Chapman submitted a paper to the World Indigenous Law Conference. Her paper, “Black Water - The Devastating Effects on the Core Values of the A:shiwi (Zuni),” was selected from more than fifty submissions. The conference, which is held every two years, was hosted in North America for the first time this year, and Chapman went to Irvine, CA to give her presentation. Chapman credits the Pre-Law Summer Institute, an intensive two-month program that prepares individuals for the rigors of law school, for paving the way for her to become an advocate.